In the final act of the famous Kabuki play 'Kanadehon Chūshingura' (‘The treasury of loyal retainers’), the 47 'rōnin' (or masterless samurai) attacked the mansion of the villain Moronao to avenge their lord on a snowy moonlit night. 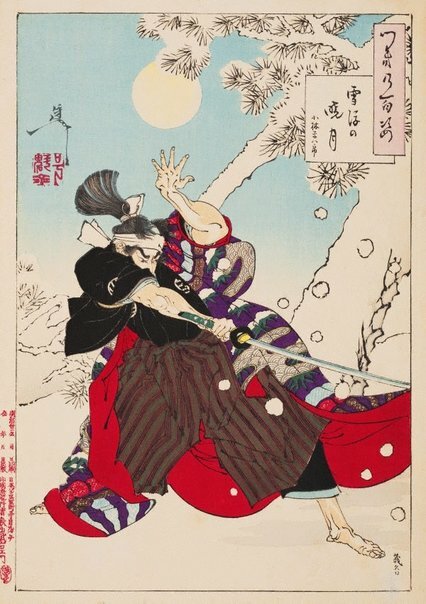 In this print, Yoshitoshi chose to illustrate this famous event from an unusual angle, focusing on Kobayashi Heihachirō, Moronao’s retainer, instead of showing one of the 'rōnin' who are actually the heroes of the story. Faithful to the story, Heihachirō is shown here wearing his old nurse’s robe, as he attempted to catch the attackers off guard. Heihachirō defended his lord with great courage, but was killed.